LIGHTWEIGHT AND COMFORTABLE: The earbud is made of the light and skin-friendly aluminum metal and plastic case, only 0.5oz/15g, making you feel comfortable when enjoying music. Built-in magnet, the earbuds will attach each other when not in us. CD-LIKE AUDIO SOUND QUALITY: Using AptX decoder chip and advanced 10mm driver, the headphones will provide the CD-like high quality tone for you. Support the frequency of 2.4-2.48GHz, you can enjoy the pure and deep bass music, suitable for most of the music style. LATEST BLUETOOTH V4.2 & WIDELY COMPATIBLE: Adopted with the latest Bluetooth V4.2 chip, ensure the high efficiency and stability of the Bluetooth signal. 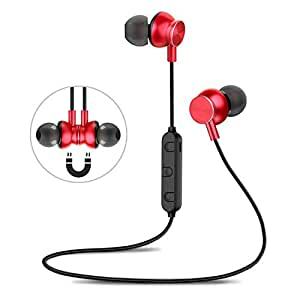 The headphones support 2 devices connected at the same time, also compatible with iPhone, Samsung, LG, Sony, iPad, iPod etc. IN-LINED MICROPHONE AND MULTIFUNCTIONAL BUTTON: You can skip the songs to Next or Previous easily by clicking the Volume button +/-. Answering and Talking on the phone by hands-free. MIJIAER 12 MONTHS WARRANTY: You can enjoy the 12 months warranty and all day online service. You wonât lose anything if you are not satisfied with our product. Every problem will be solved for you until you feel satisfied with us. The Bluetooth headphones adopted the latest Bluetooth V4.2 chip+EDR, you can connect with your phone quickly just with 2 steps. And the next time you want to use the headphones, it will pair with your phone automatically just in 1 second.